Nothing beats a beautiful ticking timepiece that serves as a wonderful example of intricate human engineering. Derrick Holmes takes being a visionary to another level! The 54-year-old is a trailblazer and his undaunted spirit led him to become the only African-American watch manufacturer in the world. 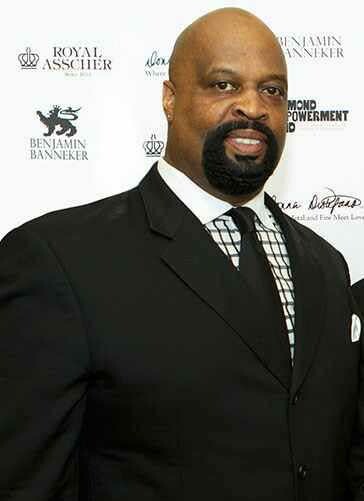 Holmes is the founder and CEO of the Benjamin Banneker Watch and Clock Company that he began in 2003. Originally from Waterloo, Iowa, Holmes was inspired by the remarkable accomplishments of the Black historical mathematician/inventor, Benjamin Banneker, who in 1753, built the first clock that was made in America and created out of wood. The huge growth and immense success of the Banneker brand is evidenced by the fact that not only celebrity watch lovers like Spike Lee, Denise Nicholas, Snoop Dogg, Brad Pitt and Tyler Perry can afford to sport the timelessly elegant watches on their wrists but ‘Mr. and Mrs. Everyday’ can, as well. In this hustle and bustle digital world we live in, Holmes has inspired a kind of renewed reverence for craftsmanship with his beautiful creations. Each timepiece stirs a sense of responsibility, family obligation, dynasty, and heritage; they are masterpieces of horological art that can be passed down from generation to generation. A shiny wrist piece does say something about earning power but also taste. Millennials can argue all day that watches have been replaced by time-keeping cell phones. Baby boomers, however, know and understand, nothing beats a beautiful ticking timepiece that serves as a wonderful example of intricate human engineering; just ask Holmes! The watch creator extraordinaire sat down with 50BOLD to discuss the philosophy/history of his company, as well as his vision for the future. 50BOLD: How did you decide to go into watchmaking? Holmes: My father was terminally ill back in 1998. I was driving 12-hours back and forth from Denver to Iowa to be by his bedside. On one of my trips back, while driving coming through Nebraska, I suddenly got an epiphany about putting signatures and likenesses of athletes inside of a watch. Now bear in mind, I hadn’t been a watch collector. I did like nice watches but I did not have a special relationship with them. At that time I had my own advertising company, Hollyrock, a one-stop shop where I wrote, sang and produced jingles for businesses such as Coors, NBA, and TWA. I would do the commercial concepts, slogans, production and then have the ad ready for TV or radio spots. So while driving, the watch concept hit me like a ton of bricks. It was like “WOW!” When I got back to Denver, I just couldn’t get the watch idea out of my mind; I thought about it constantly so I began to draw watches. Two weeks later I received yet another epiphany…Marquee Watch. So my first company was the Marquee Watch Company. One day, I was at a friend’s house and I saw a calendar that had African-American contributions and civilizations. I had known about Benjamin Banneker but I only knew about him as a city planner and surveyor of Washington D.C. So when I learned that Banneker had created the first fully functional clock in America that was made out of wood, I felt like Moses upon seeing the burning bush! I then became all consumed with Banneker, researching him and the watchmaking industry as well. I was able to buy the rights to the Benjamin Banneker name. So this is how the Banneker company was born, it is the road I traveled to get here. 50BOLD: What distinguishes your luxury brand from the others? What defines a Banneker timepiece? Holmes: What sets us apart is that our timepieces are exclusive, no two are alike and they contain some exotic wood element like zebra, red paddock, African maple, Egyptian tiger that come from places all over the world. 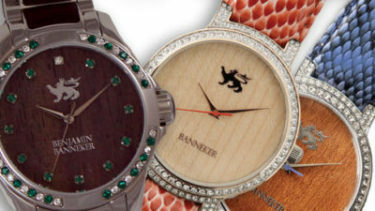 Each timepiece pays homage to Banneker’s wooden clock. I create the watches myself and take it very seriously. I think the style, design and the feel of our watches are very unique. Sporting a timepiece on your wrist whose design was inspired by such an incredible African-American inventor just enhances its wearability even more. 50BOLD: What is your history with watches? Holmes: I was not a collector of watches. As a matter of fact, 60% of the men I meet are watch aficionados. These collectors certainly know their watches! I’d always like to dress nice and would have a decent watch or two but that was the extent. I actually didn’t know a lot about watches and about the mechanics involved, so I had to really study. Oddly enough, my real interest in watches began with that epiphany. 50BOLD: As a watch creator/designer what are your biggest manufacturing challenges? Holmes: I think one of the challenges I face as a designer of timepieces is making sure that I just don’t create something that I like. When I design, I am supposed to be thinking, creating, across the board to suit the various tastes of watch buyers everywhere. I think it’s like when you write a song, movie or book, you hope that the end result will resonate with other people. 50BOLD: Have you encountered racism in trying to get your product on the market? Holmes: I can’t say I have experienced racism per se. What I can say is that I am the only Black-owned and operated watch and clock company in the world right now. Right now in the world! I’m only the second Black man in the world to have ever designed a clock, and the very first one is our namesake, Benjamin Banneker. I’ve had some serious ups and downs just like many entrepreneurs but my tenacity and firm belief in my product has kept me pushing forward. Since this is a market that has been European dominated for so many years, as a Black person, I’ve been fortunate not to encounter racism like other people of color in their respective entrepreneurial businesses. 50BOLD: Where is watchmaking going? Holmes: I think that watchmaking is going to always be around. Sure, people now have their cell phones and there are also quite a few things that can keep time as well. In 2007 and 2008 however, the watch business really exploded and now people are wearing timepieces as fashion statements, as a way to speak to who they are. It’s funny, back in the day you had to wear a watch to tell time, so it was more of a mandatory accessory. Now, wearing a watch is not mandatory. You do have the SmartWatches and people are liking and wearing them. If I had gotten into another business, I would not own a SmartWatch because it’s like…enough gadgets already! These tech kinds of timepiece demands have not really hurt the watch business because, for men, in particular, this is the only accessory we’ll wear. Women wear more jewelry and such but for a man, his watch is what makes his stylish statement. I think watches will be around forever. 50BOLD: How are you getting the word out about your watches. Luxury ad placements? Celebs who sport them? Holmes: A lot of celebrities wear our watches and have spread the word about them both verbally and through social media. We, however, run a pretty serious social media campaign. We also advertise in other mediums and have a vice president who solely handles this leg of the operation. Right now, we have a 95% presence online. This year we’re probably going to work to get into a few retail stores. Our products have done really well online. I’ve been in the watch business now for twenty years, this year is our 20th anniversary. And I used to dream about being in all these stores and still would like to do this but it is kind of difficult especially if you’re a smaller brand. These retailers make a 100% mark up on a product. So if you’re selling a watch for $300, you have to sell it to them for $150. Having your product sold at a retailer is a good look but it’s not as pressing now because retailers like Amazon have a lot of people buying online. It’s unbelievable! I’m old school, you couldn’t pay me to buy a watch online but many people do their shopping on their computers. We had an incredible year last year. We’ve been growing 300% every year online. So when we do begin moving in the direction of retailers, we want to be able to negotiate well with stats and all. 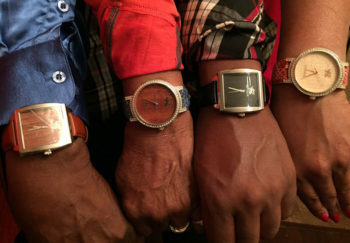 50BOLD: How have your watches been received by the Black community? Holmes: We’ve been so incredibly well-received by people all around the country. One of my business partners is Joe Madison, The Black Eagle and he is one of the most influential African-Americans in the country. He’s been a civil rights activist for years and currently hosts a Sirius XM radio show, Urban View, out of Washington, D.C. with a listening audience of over 5 million people. We’re on his show a lot and he has been supportive in helping to spread our message. What he’s bringing to the board alone is going to help us reach our mission nationally. We do not want to pigeonhole our brand because we want everyone to buy it. Most people don’t know that a Black man created the first clock in America. So when Black people hear this, they feel compelled to purchase one of my watches. I don’t mind that you have a Tag Heuer or Rolex, but do add a Banneker watch and clock to your arsenal. We’re not haters over here. We want to see everyone do well. Black people love my products because they are wearing something historical that makes them feel special and gives them a sense of pride. 50BOLD: Is there a line of women’s watches in the works? Holmes: I am creating a brand especially for the ladies, Lady Banneker, that will consist of watches, purses, sunglasses; the items will contain an element of wood as well, and be tied in with the incredible Banneker story. We are also coming out with a brand called Baby Banneker, that will include products to also help children tell time. This seems to be a lost art with many of them who only seem to recognize digital time. 50BOLD: Where could our readers purchase your watches? What is the price range? Holmes: A lot of our watches are unisex. The trend for women and watches is that they are buying the oversized men’s-inspired timepieces. 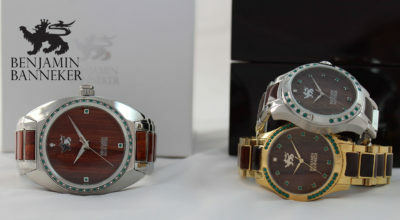 Our watches can be purchased at www.bannekerwatches.com and the prices range from $170 to $600. 50BOLD: You have placed our youth on your radar, what are you working on? Holmes: We’re working on building The Benjamin Banneker Universal Institute that will teach our youth how to not only make watches but learn other trade skills as well. There are so many things we want to teach our youth! We want to build something substantial and significant in place that will be there for future generations. The institute will be developed on the South Side of Chicago. It will be our first location because the youth in Chicago has to deal with so many problems. I’ve brought together a team of successful entrepreneurs that I call the “Rainmakers” to work with me that include folks like former NBA player Tim Hardaway, Chairman of Wild Oats Marketing, Jim Keyes; businesswoman Leslie Kilgore, and Joe Madison. I firmly believe that if our youth are given positive alternatives, then positive change will come about. Another great component of this project will include programs for the adults in the community as well. Right now we’re renovating a building that we just closed on and hope to have some programs implemented in June that will take place in it. 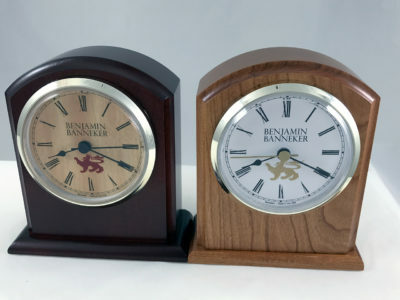 Our future goal is to also instill a Benjamin Banneker manufacturing plant on Chicago’s South Side where residents can be employed in careers crafting clocks, jewelry, and other products. The plant will also house a community center where high school and college students, as well as adults of all ages, can learn design, music, film, science, and publishing. The entire project reflects the true cultivating spirit of Benjamin Banneker. I would ideally like to bring this pilot program to other parts of the country. Previous articleDo you need a refresher on smartphone etiquette?